Of late the world has been hit by unfortunate happenings that caused the demise of a large number of people.. The first one that took the world by storm was the sudden crash of a large Aircraft, an Ethiopian Airline Boeing 737 with 157 people and bound for Kenya from Ethiopia. The sad aspect of that accident is that all the pilots and beautiful hostesses lost their lives together with young men among whom are students and workers of the United Nations. This situation means that the world has lost valuable human resources and would take a long time to find replacements for nations and families concerned. I know that the affected Nations and insurance companies concerned would have to cough up huge cash running into thousands of dollars for the families of the dead occupants of the aircraft. The affected Aircraft has to be replaced at a huge cost. No one thought the tragedy would happen to an Aircraft from Boeing with rich experience in the aviation industry and to Ethiopian Airlines also with vast experience in flying across the world. Some people were heard suggesting that the Boeing Aircraft have become sophisticated and therefore required highly skilled pilots, yes with the upgrading of their skills and to some extent scientific levels. This suggestion is right because apart from the Ethiopian aircraft, other Boeing Aircrafts also crashed of late. Well, the grounding of all Boeing 737 by some nations, especially in Africa, is welcome news. 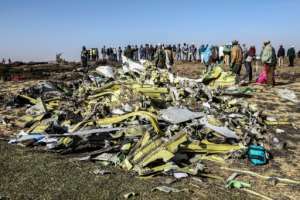 That apart, It is believed that the tragic aircraft crashes are being investigated..the knowledge and skills of pilots propelling the aircraft must be reviewed to determine whether they're fit for the planes. This is necessary because people all over the world would continue to fly out nation on aircraft. This author has authored 480 publications on Modern Ghana.